BRIDGEPORT, Conn. – Napheesa Collier scored 28 points, Gabby Williams had 25 and UConn advanced to its 10th consecutive Final Four with a 90-52 victory against Oregon on Monday night. Top-seeded UConn (36-0) will face Mississippi State on Friday night in Dallas in the national semifinals. The win was the Huskies’ 111th consecutive victory and moved coach Geno Auriemma past Pat Summitt for the most NCAA Tournament victories. Auriemma now has 113 and counting. The Huskies jumped all over 10th-seeded Oregon (23-14), which had made an impressive run through the tourney. Leading 6-4, UConn scored 17 straight points. Saniya Chong got the game-changing burst started with consecutive 3-pointers. Nearly 4 1/2 minutes later she capped the burst with a layup that made it 23-4. Oregon closed to 34-21 midway through the second quarter, but UConn put the game away by scoring 15 of the final 18 points of the half. The Huskies had several questions heading into their first season since losing their big three of Breanna Stewart, Moriah Jefferson and Morgan Tuck to graduation. But they have answered every test so far, turning away every challenge while remaining unbeaten. Now UConn has a new trio leading the way. Collier and fellow sophomore Katie Lou Samuelson were honored as AP All-Americans on Monday with Williams, a junior, making the second team. The Huskies head to Dallas just two wins away from a fifth consecutive title and 12th overall. Oregon’s future is bright. 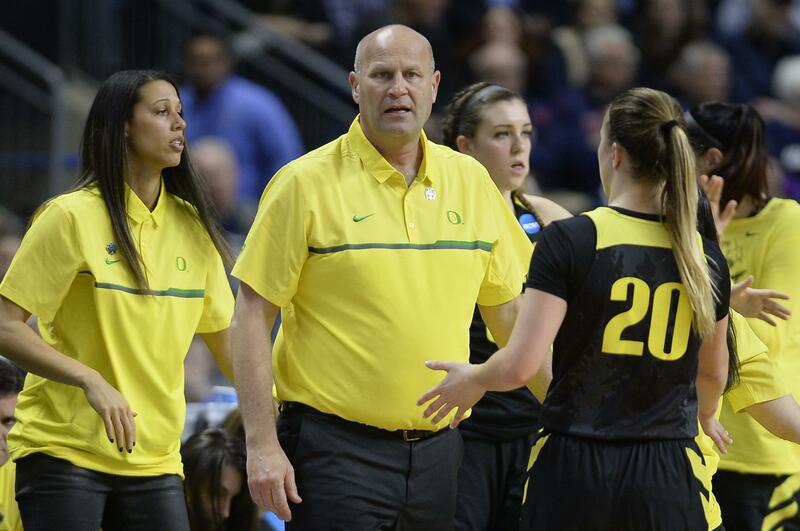 Coach Kelly Graves’ team is led by outstanding freshmen Sabrina Ionescu, Ruthy Hebard and Mallory McGwire. The trio averaged 36.8 points combined this season. Ionescu led the way against UConn with 15 points. The Ducks upset seventh-seeded Temple, No. 2 Duke and No. 3 Maryland to get to the Elite Eight for the first time in program history. Published: March 27, 2017, 8:46 p.m.